(Newser) – "I am disappointed. I am embarrassed. I am ashamed." So read an email Roger McNamee sent to Mark Zuckerberg and Sheryl Sandberg just days before the 2016 election. McNamee is the Zuckerberg mentor who convinced the Facebook CEO to hire Sandberg in the first place, and as an 11,000-word article by Nicholas Thompson and Fred Vogelstein for Wired explains, he was one of the first to notice the proliferation of fake news on the platform. 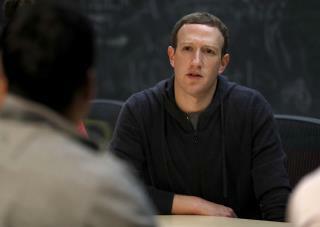 The article takes readers through "the most tumultuous two years of Facebook's existence"—that would be these last two—based in part on interviews with 51 current and former employees (one so wary of his employer that he asked their phones be turned off so Facebook couldn't track the devices' proximity to each other). I remember the first time someone told me something they'd read on Facebook cause I've never joined and I just looked at her and said--that's not true. She was shocked that liberals on a plane got upset and began to complain because the loading of an American soldier's casket was taking too long. Not true because it has an intent to manipulate the reader to feel negative about an entire group. That's not news--that's the dark art of Rupert Murdoch. And as J Smith said--it's all about money. MSNBC and CNN ran more stories on Hillary's emails than FOX. Because the story made money. And media doesn't mean news. It means everything and news. Farcebook is a Trojan horse for them commie Russkies.